For all its complexity, your elbow is a fairly rugged joint that can withstand high repetitive force loads. Nevertheless, overuse from sports like tennis or golf, repetitive occupational use, or carrying heavy loads with an extended elbow can all lead to debilitating chronic pain that is difficult to get rid of. When you are experiencing elbow pain that will not let up, you might try common remedies like ice and NSAIDs to at least get some temporary relief. But ongoing pain can signal a serious injury that may require more targeted treatment. The first step is to identify the exact cause of pain, so you can take an effective treatment approach. Lateral Epicondylitis (Tennis Elbow): Tennis elbow symptoms include pain at the outside of elbow that sometimes radiates into the forearms and wrists. Therapeutic tennis elbow treatment can speed recovery and prevent further injury. Medial Epicondylitis (Golfer’s Elbow): Symptoms include pain on the inside of the elbow. Poor golfing technique is often the cause, although other activities can bring on medial epicondylitis, like weight training or construction work. Radial Tunnel Syndrome: This condition occurs when the radial nerve gets entrapped or compressed as it passes through the tunnel space at the elbow, alongside the bones and muscles of the forearm. Cubital Tunnel Syndrome: In this condition, the ulnar nerve (the “funny bone” nerve) is overstretched or compressed in the cubital tunnel, leading to pain, numbness or weakness in the forearm, hand or ring and baby fingers. PIN Syndrome: Entrapment of compression of the Posterior Interosseous Nerve (PIN) can mimic the symptoms of tennis elbow pain. Fracture: The large bony prominence at the back of the elbow can be fractured from direct impact or a fall. Triceps Tendinitis: The tendons of the triceps can become inflamed due to overuse or repetitive motion, causing pain that subsides with rest. In advanced stages, tendinitis can degenerate to tendinosis, a condition where tendon tissue becomes damaged at the cellular level. Elbow tendon pain treatment can promote regeneration of healthy tendon cells. Bursitis: A bursa pad that provided cushioning within the elbow joint can sometimes become inflamed from overuse, putting pressure on nearby soft tissues and nerves. While some conditions that cause elbow pain may eventually go away on their own with rest, the condition may flare up again unless underlying issues are addressed. Diagnosis of your elbow pain begins with a throughout health history and physical exam. You may be asked to perform some simple range of motion or strength exercises to evaluate the effect of your pain on mobility. At NYDNR, we use real-time diagnostic ultrasound to view the structures associated with your elbow, including the wrist, shoulder and neck. Ultrasound allows us to view your joints in motion, in real time, to see how the surrounding structures interact. We are then able to pinpoint the source and severity of your injury. Accurate diagnosis is key to determining a correct course of treatment. In many clinics, diagnosis is based primarily on the patient’s reported symptoms. However, symptoms are often similar for completely different conditions. You could undergo months of therapy for the wrong condition, without satisfactory results. 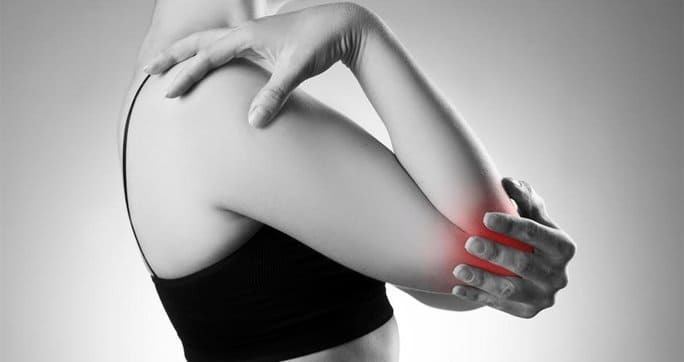 If you are suffering from ongoing elbow pain, the orthopedic specialists at NYDNRehabcan help. We use cutting edge technologies and innovative therapies, combined with years of expertise, to diagnose and treat patients with chronic elbow pain.